صید محمدی, عبدالمطلب, عسگری, قربان, مهر علی پور, جمال, شعبانلو, امیر, الماسی, حلیمه, ظاهری, فیروزه. (1395). اکسیداسیون سونوشیمیایی رنگ اسید بلو 113 در محیط‌های آبی با استفاده از پراکسید هیدروژن و پرسولفات فعال شده با آهن فرو. مجله آب و فاضلاب, 27(2), 2-13. عبدالمطلب صید محمدی; قربان عسگری; جمال مهر علی پور; امیر شعبانلو; حلیمه الماسی; فیروزه ظاهری. "اکسیداسیون سونوشیمیایی رنگ اسید بلو 113 در محیط‌های آبی با استفاده از پراکسید هیدروژن و پرسولفات فعال شده با آهن فرو". مجله آب و فاضلاب, 27, 2, 1395, 2-13. صید محمدی, عبدالمطلب, عسگری, قربان, مهر علی پور, جمال, شعبانلو, امیر, الماسی, حلیمه, ظاهری, فیروزه. (1395). 'اکسیداسیون سونوشیمیایی رنگ اسید بلو 113 در محیط‌های آبی با استفاده از پراکسید هیدروژن و پرسولفات فعال شده با آهن فرو', مجله آب و فاضلاب, 27(2), pp. 2-13. صید محمدی, عبدالمطلب, عسگری, قربان, مهر علی پور, جمال, شعبانلو, امیر, الماسی, حلیمه, ظاهری, فیروزه. اکسیداسیون سونوشیمیایی رنگ اسید بلو 113 در محیط‌های آبی با استفاده از پراکسید هیدروژن و پرسولفات فعال شده با آهن فرو. 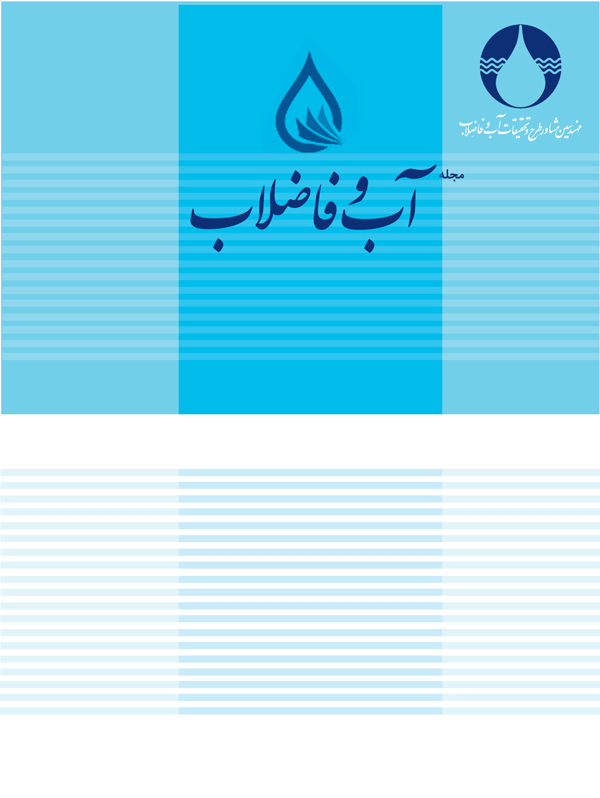 مجله آب و فاضلاب, 1395; 27(2): 2-13. رنگ‌های آزو که در ساختار آنها حلقه‌های بنزن وجود دارد، از جمله مشکلات عمده محیط زیستی به‌شمار می‌روند. در این پژوهش تجربی کارایی فرایندهای US/H2O2/Fe2+ و US/S2O82-/Fe2+ در تخریب رنگ اسید بلو 113 مورد بررسی قرار گرفت. تأثیر پارامترهای مؤثر در فرایند، نظیر pH محلول در محدوده 3 تا 11، غلظت‌های متفاوت H2O2 و S2O82- در محدوده 1 تا 10 میلی‌مولار، اسید سولفوریک در محدوده 01/0 تا 1 میلی‌مولار و غلظت اولیه رنگ با استفاده از یک محفظه منقطع مولد التراسوند در فرکانس40 کیلوهرتز بررسی شد. همچنین تأثیر هوادهی در کارایی فرایند و تغییرات طیف UV-Vis رنگ در شرایط بهینه بررسی شد. مطابق با نتایج، با افزایش pH محیط آبی، کارایی حذف رنگ در هر دو فرایند به‌طور چشمگیری کاهش یافت، به‌طوری که بیشترین میزان حذف رنگ در هر دو فرایند در pH برابر 3 مشاهده شد. افزایش غلظت FeSO4 از 5/0 میلی مولار، کارایی حذف رنگ در هر دو فرایند را کاهش داد. در فرایند US/H2O2/Fe2+ شرایط بهینه برای حذف 5/93 درصد رنگ با غلظت اولیه 50 میلی‌گرم در لیتر در غلظت‌‌های H2O2 و FeSO4 به ترتیب 5/2 و 05/0 میلی‌مولار به‌دست آمد. در همین شرایط کارایی فرایند US/S2O82-/Fe2+ در غلظت5/2 میلی مولار S2O82-، 3/94 درصد به‌دست آمد که حاکی از تأثیر بیشتر فرایند US/S2O82-/Fe2+ در کاهش پیک 567 نانومتر ساختار رنگ نسبت به فرایند US/H2O2/Fe2+ بود. همچنین مشاهده تغییرات طیف UV-Vis رنگ اسید بلو 113 نشان داد، فرایند US/H2O2/Fe2+ نسبت به فرایند US/S2O82-/Fe2، کاهش بیشتری در پیک‌های 276 و 203 نانومتر ایجاد کرده است. Residual Azo dyes pose a major environment problem due to the benzene rings present in their structure. In this experimental study, the efficiencies of the US/H2O2/Fe2+ and US/S2O82‒/Fe2+ processes in degrading Acid Blue 113 Azo were investigated. For this purpose, the effects of the parameters involved in these processes such as initial solution pH in the range of 3 to 11, different concentrations of H2O2, and ‒S2O82 in the range of 1 to 10 mM, those of FeSO4 in the range of 0.1 to 1 mM, and different initial dye concenterations were investigated in a batch ultrasound reactor operated at 40 kHz. Also, the effects of aeration on process efficiency and fluctuations in the dye UV-Vis spectrum were investigated under optimum conditions. Based on the results obtained, dye removal efficiency decreased considerably in both processes with increasing pH such that maximum removal efficiency was obtained at pH 3 in both processes. Similarly dye removal efficiency decreased in both processes when FeSO4 concentration rose above 0.5 mM. The optimum conditions in the US/H2O2/Fe2+ process to achieve a removal efficiency of 93.5% for an initial dye concentration of 50 mg/L involved H2O2 and FeSO4 concentrations of 2.5 and 0.05 mM, respectively. Under the same optimal conditions, the efficiency of the US/S2O82‒/Fe2+ process was found to be 94.3% for a S2O82‒ concentration of 2.5 nM. These results suggest that the US/S2O82‒/Fe2+ is more effective than the US/H2O2/Fe2+ in reducing the 567 nm peak of the dye structure. Finally, examination of the changes in the UV-Vis spectra of Acid Blue 113 showed that the US/H2O2/Fe2+ process led to greater declines in the 276 and 203 nm peaks. 1. Karimi, A., Mahdizadeh, F., and Eskandarian, M. (2012). “Enzymatic in-situ generation of H2O2 for decolorization of Acid Blue 113 by fenton process.” Chemical Industry and Chemical Engineering Quarterly, 18(1),89-94. 2. Ghodsian, G., Ayati, B., and Ganjidost, H. (2011). “Determination of optimum amounts of effective parameters in reactive dyes removal using photocatalytic reactions by immobilized TiO2 nano particles on concrete surface.” J. of Water and Wastewater, 24-3(87), 45-53. (In Persian). 3. Movahedian Attar, H., and Rezaei, R. (2006). “Investigating the efficiency of advanced photochemical oxidation (APO) technology in degradation of direct azo dye by UV/H2O2Process.” J. of Water and Wastewater, 17-3(59), 75-83. (In Persian). 4. Ghoneim, M.M., El-Desoky, H.S., and Zidan, N.M. (2011). “Electro-fenton oxidation of sunset yellow FCF azo-dye in aqueous solutions.” Desalination, 274(1), 22-30. 5. Krishnakumar, B., and Swaminathan, M. (2010). “Solar photocatalytic degradation of acid black 1 with ZnO.” Indian Journal of Chemistry, 49,1035-1040. 6. Safarzadeh-Amiri, A., Bolton, J.R, and Cater S.R. (1996). “The use of iron in advanced oxidation processes.” J. of Advanced Oxidation Technologies, 1,18-26. 7. Özdemir, C., Öden, M.K., Şahinkaya, S., and Kalipci, E. (2011). “Color removal from synthetic textile wastewater by sono‐fenton process.” Clean–Soil, Air, Water, 39(1), 60-76. 8. Li, J.T., and Song, Y.L. (2010). “Degradation of AR 97 aqueous solution by combination of ultrasound and Fenton reagent.” Environmental Progress and Sustainable Energy, 29(1),101-106. 9. Babuponnusami, A., and Muthukumar, K. (2012). “Advanced oxidation of phenol: A comparison between fenton, electro-fenton, sono-electro-fenton and photo-electro-fenton processes.” Chemical Engineering Journal, 183,1- 9. 10. Seid-Mohammadi A., and Movahedian, H. (2010). “p- chlorophenol oxidation in industrial effluent by ultrasonic/fenton technology.” J. of Water and Wastewater, 22-4(80), 43-49. (In Persian). 11. Ninomiya, K., Takamatsu, H., Ohnishi, A., Takahashi, K., and Shimizu, N. (2013). “Sonocatalytic-fenton reaction for enhanced OH radical generation and its application to lignin degradation.” Ultrasonics Sonochemistry, 20,1092-1097. 12. Yangang, L., Wen-Pin, H., Rovshan, M., and Xiaomei, W. C.P. H. (2012). “Combined ultrasound and Fenton (US-Fenton) process for the treatment of ammunition wastewater.” J. of Hazardous Materials, 244-245(0), 403-411. 13. Basturk, E., and Karatas, M. (2014). “Advanced oxidation of reactive blue 181 solution: A comparison between fenton and sono-fenton process.” Ultrasonics Sonochemistry, 21(5),1881-1885. 14. Asgari, Gh., Chavoshani, A., Seid-Mohammadi A., and Rahmani, A. (2013). “Removal of pentachlorophenol using microwave assisted persulfate from synthetic wastewater.” J. of Water and Wastewater, 25-3(91), 29-37. (In Persian). 15. Oh, S-Y., Kang, S-G., Kim D-W., and Chiu, P.C. (2011). “Degradation of 2,4-dinitrotoluene by persulfate activated with iron sulfides.” Chemical Engineering Journal, 172(2–3),641-646. 16. Li, S-X., and Hu W. (2011). “Decolourization of acid chrome blue K by persulfate.” Procedia Environmental Sciences, 10, 1078-1084. 17. Oh, S-Y., Kang, S-G., and Chiu, P.C. (2010). “Degradation of 2,4-dinitrotoluene by persulfate activated with zero-valent iron.” Science of The Total Environment, 408(16), 3464-3468. 18. Wang, X., Wang, L., Li, J., Qiu, J., Cai, C., and Zhang H. (2014). “Degradation of acid orange 7 by persulfate activated with zero valent iron in the presence of ultrasonic irradiation.” Separation and Purification Technology, 122(0), 41-46. 19. Li, H., Guo, J., Yang, L., and Lan, Y. (2014). “Degradation of methyl orange by sodium persulfate activated with zero-valent zinc.” Separation and Purification Technology, 132(0),168-173. 20. Cai, C., Zhang, H., Zhong, X., and Hou, L. (2015). “Ultrasound enhanced heterogeneous activation of peroxymonosulfate by a bimetallic Fe–Co/SBA-15 catalyst for the degradation of orange II in water.” J. of Hazardous Materials, 283(0),70-79. 21. Saravanan, M., Sambhamurthy, N.P., and Sivarajan, M. (2010). “Treatment of ccid blue 113 dye solution using iron electrocoagulation.” CLEAN–Soil, Air, Water, 38(5‐6), 565-571. 22. Shemer, H., and Linden, K.G. (2006). “Degradation and by-product formation of diazinon in water during UV and UV/H2O2 treatment.” J. of Hazardous Materials, 136(3), 553-559. 23. Huang, Y-H., Huang, Y-F., Chang, P-S., and Chen C-Y. (2008). “Comparative study of oxidation of dye-Reactive Black B by different advanced oxidation processes: Fenton, electro-fenton and photo-fenton.” J. of Hazardous Materials, 154(1-3), 655-662. 24. Xu, X-R., and Li X-Z. (2010). “Degradation of azo dye orange G in aqueous solutions by persulfate with ferrous ion.” Separation and Purification Technology, 72(1), 105-111. 25. Masomboon, N., Ratanatamskul, C., and Lu M-C. (2010). “Chemical oxidation of 2, 6-dimethylaniline by electrochemically generated Fenton's reagent.” J. of Hazardous Materials, 176(1-3), 92-98. 26. Zhou, L., Zheng, W., Ji, Y., Zhang, J., Zeng, C., Zhang, Y., et al. (2013). “Ferrous-activated persulfate oxidation of arsenic(III) and diuron in aquatic system.” J. of Hazardous Materials, 263, (2), 422-430. 27. Romero, A., Santos, A., Vicente, F., and González, C. (2010). “Diuron abatement using activated persulphate: Effect of pH, Fe(II) and oxidant dosage.” Chemical Engineering Journal, 162(1), 257-265. 29. Wang, X., Yao, Z., Wang J., Guo, W., and Li, G. (2008). “Degradation of reactive brilliant red in aqueous solution by ultrasonic cavitation.” Ultrasonics Sonochemistry, 15(1), 43-48. 30. Liang, J., Komarov, S., Hayashi, N., and Kasai, E. (2007). “Improvement in sonochemical degradation of 4-chlorophenol by combined use of Fenton-like reagents.” Ultrasonics Sonochemistry, 14(2), 201-207. 31. Muruganandham, M., Yang, J-S., and Wu, J.J. (2006). “Effect of ultrasonic irradiation on the catalytic activity and stability of goethite catalyst in the presence of H2O2 at acidic medium.” Industrial and Engineering Chemistry Research, 46(3),691-698. 32. Rodriguez, S., Vasquez, L., Costa, D., Romero, A., and Santos, A. (2014). “Oxidation of orange G by persulfate activated by Fe(II), Fe(III) and zero valent iron (ZVI).” Chemosphere, 101, 86-92. 33. Ioan, I., Wilson, S., Lundanes, E., and Neculai, A. (2007). “Comparison of fenton and sono-fenton bisphenol a degradation.” J. of Hazardous Materials, 142(1), 559-563. 34. Liang, C., Wang, Z-S., and Bruell, C.J. (2007). “Influence of pH on persulfate oxidation of TCE at ambient temperatures.” Chemosphere, 66(1),106-113. 35. Wu, J., Zhang, H., and Qiu, J. (2012). “Degradation of acid orange 7 in aqueous solution by a novel electro/Fe2+/peroxydisulfate process.” J. of Hazardous Materials, 215-216(0),138-145. 36. Chen, F., Li, Y., Cai, W., and Zhang, J. (2010). “Preparation and sono-fenton performance of 4A-zeolite supported α-Fe2O3.”J. of Hazardous Materials, 177(1), 743-749. 37. Naddeo, V., Belgiorno, V., Kassinos, D., Mantzavinos D., and Meric, S. (2010). “Ultrasonic degradation, mineralization and detoxification of diclofenac in water: Optimization of operating parameters.” Ultrasonics Sonochemistry, 17(1),179-185. 38. Chakma, S., and Moholkar, V.S. (2013). “Physical mechanism of sono-Fenton process.” AIChE Journal, 59(11), 4303-4313. 40. Khan, J.A., He, X., Khan, H.M., Shah, N.S., and Dionysiou, D.D. (2013). “Oxidative degradation of atrazine in aqueous solution by UV/H2O2/Fe2+, UV//Fe2+ and UV//Fe2+ processes: A comparative study.” Chemical Engineering Journal, 218(0), 376-383. 41. Rao, Y.F., Qu, L., Yang, H., and Chu, W. (2014). “Degradation of carbamazepine by Fe(II)-activated persulfate process.” J. of Hazardous Materials, 268, 23-32. 42. Weng, C-H., Lin, Y-T., and Yuan, H-M. (2013). “Rapid decoloration of reactive black 5 by an advanced fenton process in conjunction with ultrasound.” Separation and Purification Technology, 117(0),75-82. 43. Lin, H., Zhang, H., and Hou, L. (2014). “Degradation of C. I. acid orange 7 in aqueous solution by a novel electro/Fe3O4/PDS process.” J. of Hazardous Materials, 276 (0), 182-191. 44. Xu, LJ., Chu, W., and Graham, N. (2014). “Degradation of di-n-butyl phthalate by a homogeneous sono–photo–Fenton process with in situ generated hydrogen peroxide.” Chemical Engineering Journal, 240,541-547. 45. Ghauch, A., Ayoub, G., and Naim, S. (2013). “Degradation of sulfamethoxazole by persulfate assisted micrometric Fe0 in aqueous solution.” Chemical Engineering Journal, 228,1168-1181. 46. Dükkancı, M., Vinatoru, M., and Mason, T.J. (2014). “The sonochemical decolourisation of textile azo dye Orange II: Effects of Fenton type reagents and UV light.” Ultrasonics Sonochemistry, 21(2), 846-853. 47. Wang, S., Zhou, N., Wu, S., Zhang, Q., and Yang, Z. (2014). “Modeling the oxidation kinetics of sono-activated persulfate’s process on the degradation of humic acid.” Ultrasonics Sonochemistry, 23, 128-134. 48. Zou, X., Zhou, T., Mao, J., and Wu, X. (2014). “Synergistic degradation of antibiotic sulfadiazine in a heterogeneous ultrasound-enhanced Fe0/persulfate Fenton-like system.” Chemical Engineering Journal, 257, 36-44. 49. Liu, T., He, F.W., and Zhang, Y.Q. (2014). “Synergistic degradation of acid scarlet dyeing wastewater by the ultrasound/fenton method.” Applied Mechanics and Materials, 448, 34-37. 50. Sun, J-H., Sun, S-P., Sun, J-Y, Sun, R-X., Qiao, L-P., Guo, H-Q., et al. (2007). “Degradation of azo dye acid black 1 using low concentration iron of fenton process facilitated by ultrasonic irradiation.” Ultrasonics Sonochemistry, 14(6),761-766.